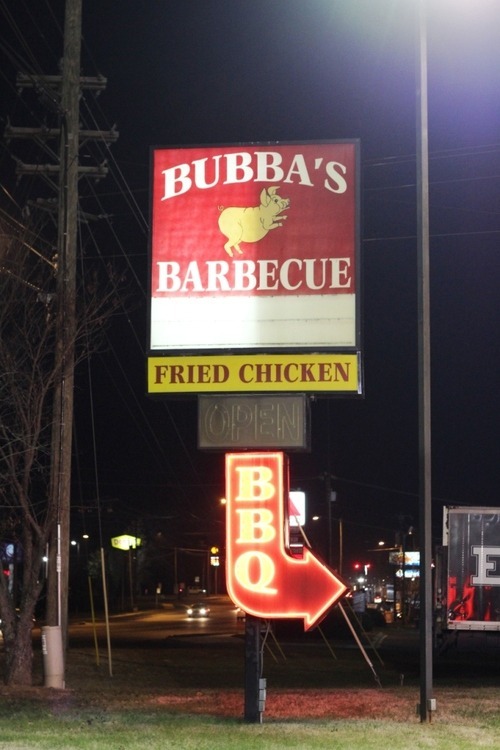 Monk: In a 2011 reader’s poll, Bubba’s Barbecue was named the third best barbecue joint in NC by Southern Living Reader’s. This was a mistake. But first, a little history. 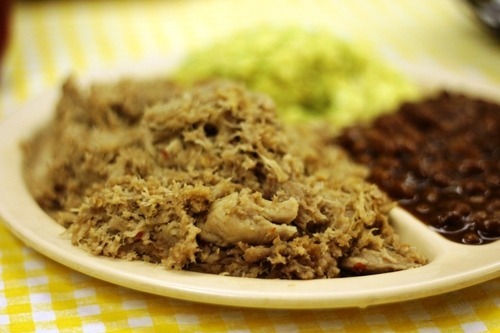 Similar to Bill Spoon’s, Bubba’s Barbecue cooks whole hog eastern NC barbecue in a town smack in the middle of the Piedmont. 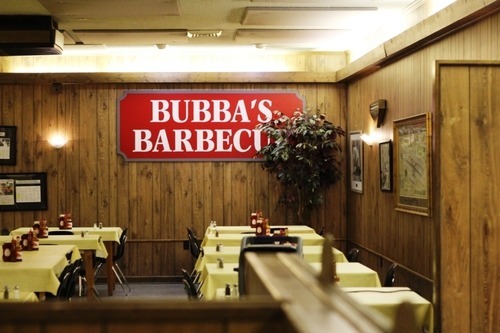 And this is no coincidence – according to Bob Garner’s Big Book of Barbecue, “[n]ot long after banker turned restaurateur [sic] Ralph Miller bought the venerable Spoon’s Barbecue on Charlotte’s South Boulevard in 1986, he changed the name to Bubba’s. 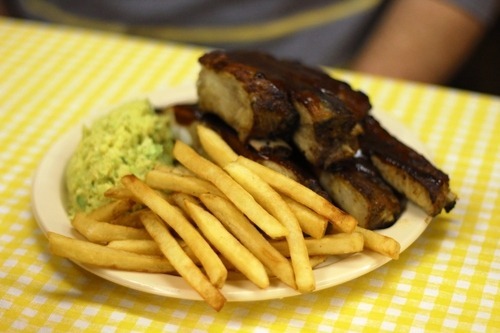 In 1994, Miller moved Bubba’s to the present location on Sunset Road.” While Bubba’s cooks eastern NC-style barbecue, you won’t find a fire pit out back. That’s because Bubba’s cooks their whole hogs in two electric pits. And in light of recently taking the True ‘Cue Pledge, I must proclaim it to be faux ‘cue. FAUX ‘CUE I SAY! Speedy: Yes. This really just shows that the readers of Southern Living magazine cannot be trusted. In fact, I did a little research (by which I mean looked on wikipedia) and found out that Southern Living magazine is published in Alabama – a state that’s only famous in barbecue terms for producing the most disgusting barbecue sauce on the planet. I did like the first thing the waitress said to us when she came to take our order – “barbecue or ribs?” So of course Monk and I ordered both. The food came out relatively shortly and the plates were rather large portions. Monk: I guess that’s what happen when you order a “Hungry plate” portion (for pork at least). The pork was chopped fairly fine – almost minced – and had a decent texture but very little smoke to it. Which is probably as expected when we are talking about barbecue cooked in an electric smoker. Speedy: The ribs were huge and meaty; however, a lot of that was because the fat was not properly rendered out of the rib and the ribs weren’t trimmed at all. Call me a diva if you want, but a good rib bone has been trimmed of the cartilage and is cooked to pull (but not fall) clean off the bone. 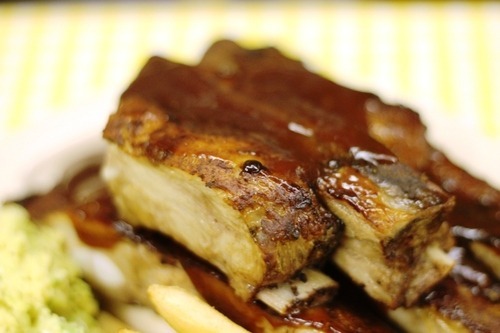 When I finish a rib, I don’t want to see anything left on the rib. This was not the case here. Also, while I appreciate a good rib sauce, I prefer a lighter sauce and a nice rub, which I think allows the flavors of the meat to come through more. 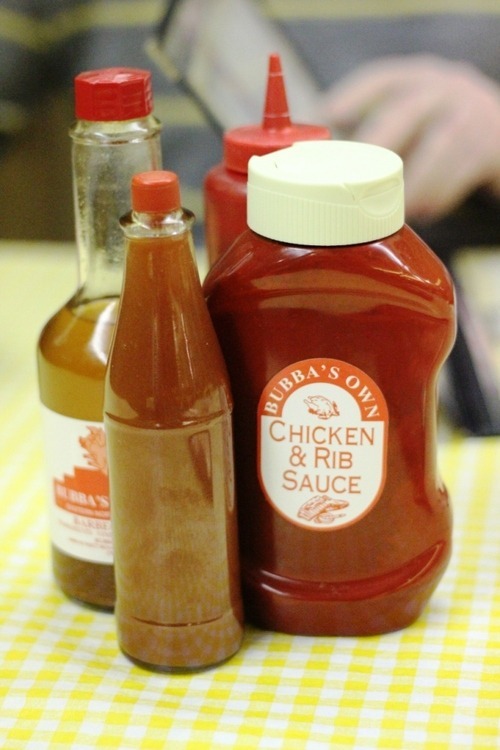 The rib at Bubba’s was all about the sauce – it came dripping and the ribs tasted as if no rub was used at all. Overall, it was a very disappointing rib experience. 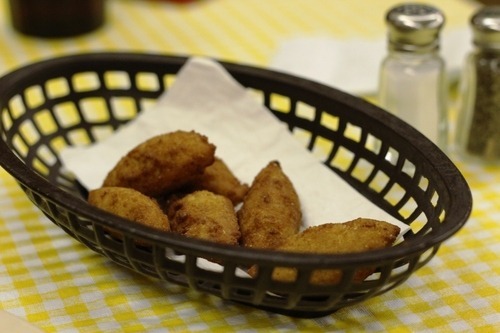 Monk: Hush puppies came in a tray for the table and you could get more if you wanted – we never did (not a good sign). 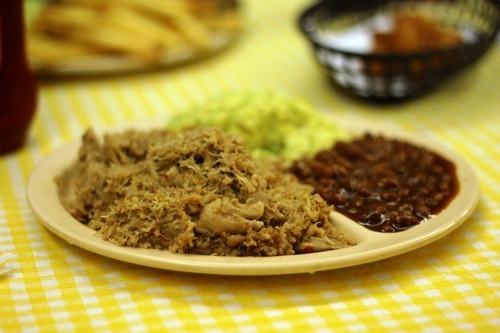 The slaw was mustard-based a la Spoon’s and the barbecue beans were nothing special. In fact, “nothing special” pretty much sums up our trip to Bubba’s Barbecue. 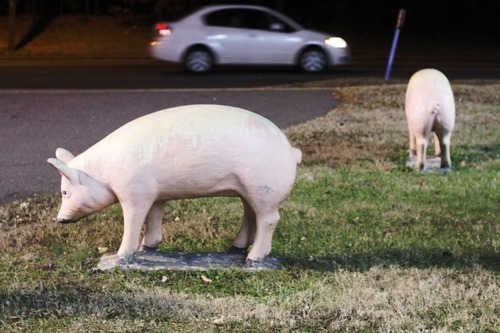 In fact, the best thing about it was probably the joint feel of the dining room and the decorative pigs out front. 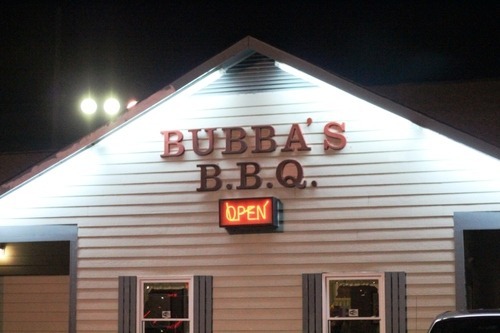 Speedy: Monk and I like to try lots of different barbecue joints, but I think both of us going in knew that Bubba’s wasn’t going to stack up against some of our favorites. In the end, I think we really made a mistake going there. Barbecue is one of my favorite things on the planet, but when it’s done wrong, it just makes me sad. There aren’t enough meals in this life to waste on mediocre ‘cue.